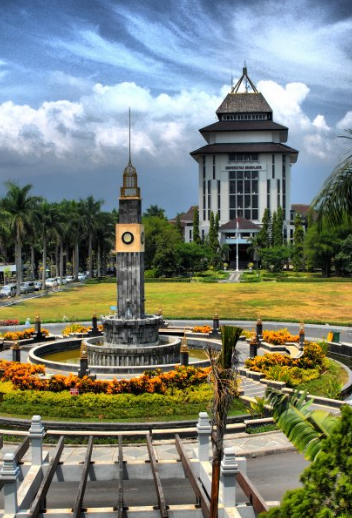 University of Brawijaya (UB) is located in the city of Malang, East Java province, Indonesia. UB was officially declared by the President of the Republic of Indonesia January 5th, 1963. There are 11 faculties and 1 program held in UB. To be an outstanding university and play an active role as an agent of change to the society through education, research and community services complies with the national and international standard. To conduct professional teaching-learning process. To promote awareness of the existence of God's creations and appreciation of human and other creatures rights. To conduct academic process that educates the students to be highly competent graduates and qualified professionals. To innovate, develop, and disseminate sciences and technologies, to empower community welfare and enhance the national culture. Three aspects of concerns are: supporting the effort to eradicate poverty and joblessness, access to higher education, and education globalization. You will be regarded as an international applicant if you do not hold Indonesian citizenship. To be able to get admission, candidates must demonstrate good academic competence which is proven with high academic merit. International applicants should apply directly to Universitas of Brawijaya by submitting a set of necessary documents (see the flowchart of admission procedure). International applicants are generally not required to sit for the entry test for admission unless a special condition occurs. The eligibility for admission is based on a desk evaluation carried out by the UB’s admission test committee on your academic achievement. International applicants must meet the academic, language requirements and commit to comply with particular regulations of Indonesian government related to education policy in order to apply for a degree at the University of Brawijaya. The name Universitas Brawijaya (Brawijaya University) was granted by the President of the Republic of Indonesia through a wire no. 258/K/61 sent on July 11, 1961. This name is derived from the title of Kings of Majapahit, a great kingdom in Indonesia from 12th to 15th centuries. UB transformed into a state university on January 5, 1963, following a Presidential Decree issued earlier in the same year. This date was later promulgated as UB's anniversary (specifically called Dies Natalies among Indonesian academic society members). Previously, Universitas Brawijaya was publicly known with the acronym of UNBRA and then UNIBRAW. On Universitas Brawijaya Senate meeting on March 17, 2008, UB was inaugurated as the official acronym of Universitas Brawijaya. The Hymn of UB was composed by a student of the Faculty of Veterinary and Animal Husbandry called Yanardhana in 1963, while the Mars of UB was composed by Lilik Sugiarto in 1996. Both songs are still frequently sung up to this day. UB campus is situated in the city of Malang, East Java, in a strategic location can easily be reached by public transportations. With trees growing in all corners of the campus and the cool air of Malang, UB indeed is a very fresh campus. As a city of education, Malang has been developing rapidly. This seems to be inseparable from the glory of East Java in the past. Today, UB is one of the leading universities in Indonesia with more than 60,000 students in various degrees ranging from the Diploma Program, Bachelor's Degree Program, Master's Degree Program, Doctoral Degree Program, and Medical Specialist Program, in 12 Faculties, 2 faculty-level Programs, 1 Vocational Program, and 1 Postgraduate Program.